Google today announced a big milestone for its Safe Browsing service: 1 billion users are now protected from malware and phishing sites. Just over a year ago, the figure was at 600 million users, meaning about 400 million users were added in just 12 months. For those who don’t know, Google Safe Browsing is a service that provides lists of URLs that contain malware or phishing content to Chrome, Firefox, and Safari browsers, as well as to Internet Service Providers (ISPs). The service can also be accessed via the public API or directly by manually changing this URL to check whichever site you want. To celebrate the 10-digit figure, Google today also launched a new Safe Browsing section over on its Transparency Report site. 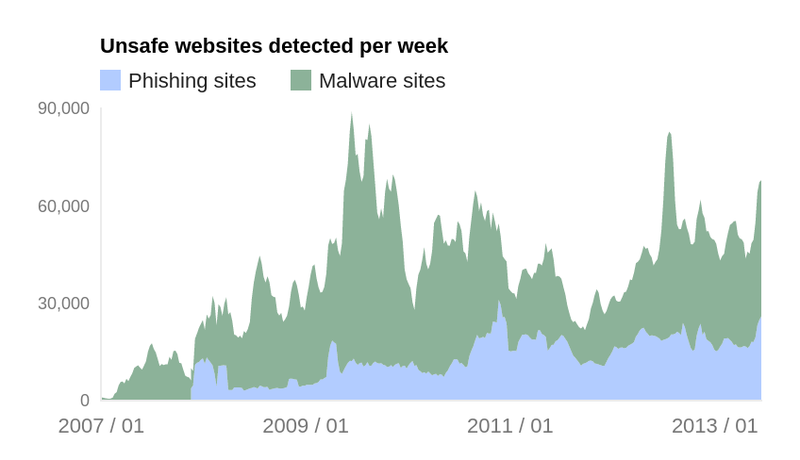 You can now check out how many people see Safe Browsing warnings each week, where malicious sites are hosted around the world, how quickly websites become reinfected after their owners remove malware from their sites, and so on. Malware sites contain code to install malicious software onto users’ computers. Hackers can use this software to capture and transmit users’ private or sensitive information. Phishing sites pretend to be legitimate while trying to trick users into typing in their username and password or sharing other private information. Common examples are web pages that impersonate legitimate bank websites or online stores. On the new page, Google notes its Safe Browsing technology examines billions of URLs and discovers thousands of new unsafe sites every day, many of which are legitimate websites that have been compromised. This translates into warnings on Google Search and in the aforementioned three browsers. That being said, the service is far from perfect. Because it is largely automatic, more than once it has flagged legitimate sites without much of an explanation, causing quite a bit of havoc for both users and the sites’ administrators. Nevertheless, it’s fair to say that Safe Browsing has largely done more good than harm in its seven-year life. At 1 billion users now, however, Google has to be increasingly more and more careful to ensure the service is working as best as possible.